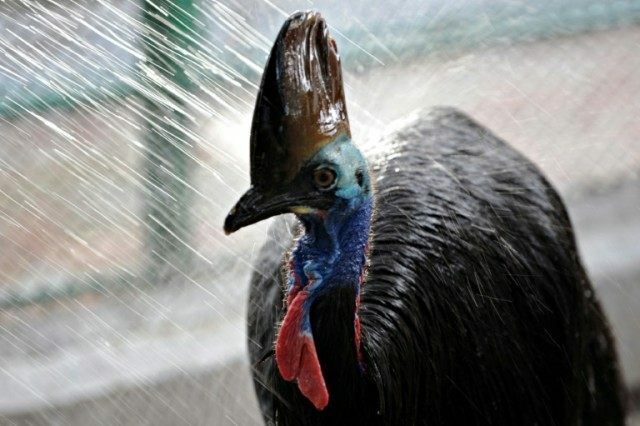 Sydney (AFP) – An Australian couple had a close encounter with one of the most dangerous birds in the world when a giant flightless cassowary wandered into their home, sending them running for cover. Peter and Sue Leach were in their house at Wongaling Beach in far north Queensland state earlier this week when the bird — which can grow up to two metres (6ft 6ins) tall — sauntered in. “My husband said, ‘look, we’ve got a visitor!’ and there he was walking into the house through the garage,” Sue Leach told AFP Friday. Leach said the cassowary, nicknamed “Peanut” by a neighbour, walked through the neighbourhood regularly as it was near a rainforest, but this was the first time she knew of it entering a home. “He didn’t bump anything or look for food or the fruit bowl, which was good, and we didn’t spook him at all, because they’re still a wild animal and they’re spooked by dogs and things like that,” she said, adding that it was “very calm”. The southern cassowary — an endangered species found only in the tropical rainforests of northeast Queensland, Papua New Guinea and some surrounding islands — is Australia’s heaviest flightless bird and can weigh 76 kilogrammes (167 pounds). It is described as one of the world’s deadliest birds due to its aggressiveness, and can seriously hurt people and pets by kicking them with its large, clawed feet. According to a 2003 study of southern cassowary attacks in Queensland, there were eight recorded incidents involving serious injuries and one death between 1926 and 1999. There is uncertainty over the size of the southern cassowary population in Australia, the federal government has said, with one estimate from 16 years ago placing it at some 2,000 breeding birds.